The writer Lemn Sissay has beaten former politician Lord Peter Mandelson in the election for the chancellorship of the University of Manchester. They featured on a shortlist of three nominees including Hallé Orchestra music director Sir Mark Elder. In a ballot of university staff and former students, Mr Sissay received 7,131 votes while Sir Mark polled 5,483 and Lord Mandelson gained 5,269 votes. 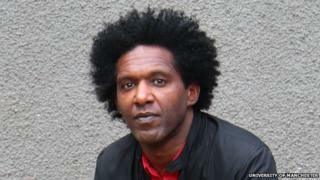 Mr Sissay said: "My primary aim is to inspire and be inspired." He added: "Reach for the top of the tree and you may get to the first branch but reach for the stars and you'll get to the top of the tree." The writer, who has authored plays and books of poetry, is also an associate artist at London's Southbank Centre. He will start the seven-year role on 1 August, replacing current chancellor, property developer Tom Bloxham MBE, the founder of Manchester-based company Urban Splash. "I am proud to be Chancellor of this fantastic University and extremely grateful to everyone who voted for me," he added. Mr Sissay recently campaigned successfully for a police investigation after complaints of historical physical and sexual abuse at a former children's home in Wigan. Professor Dame Nancy Rothwell, who is president at the university, congratulated Mr Sissay on his role, adding it was a ceremonial office, which involved "significant ambassadorial responsibilities in helping to promote the university's achievements worldwide". "Each one of the nominees had excellent credentials and would have made a fine ambassador for the University." A university spokesman said there could be "other ways" that Sir Mark and former Labour cabinet minister Lord Mandelson could support the institution, which has nearly 38,000 students. Lord Mandelson, who was a key figure in the Labour governments of Tony Blair and Gordon Brown, recently said he wanted the post "because the city of Manchester is becoming the most exciting, edgy place to be around in England". An installation ceremony will be held at the university in October.